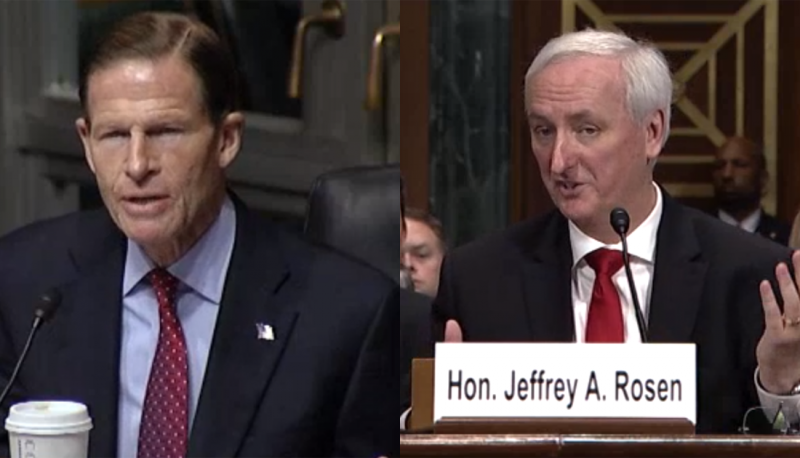 I’m just back from the Senate Judiciary Committee hearing on the nomination of Judge David Hamilton to the Court of Appeals for the Seventh Circuit, which the Republicans on the committee boycotted because they claimed they had not been given sufficient time to prepare for the hearing. In an ironic twist, the hearing was held in a small room off of the Senate floor—the same room that Senator Leahy, the Chair of the Committee, used to continue holding hearings on President Bush’s judicial nominations in the immediate aftermath of September 11th. As Senator Leahy noted today, the Democrats on the Committee have a better record of pushing through Republican judicial nominees than the Republicans had when they were in charge. Yet today, the Republicans once again were all about trying to delay the process, and we’re now even seeing complaints that the hearing was moved to the Capitol, a move which actually helped accommodate Senators who needed to be on the floor to vote on budget amendments. In the absence of the Republicans, Senator Leahy ended up asking Judge Hamilton about cases that Senator Specter had identified as potentially problematic – in other words he asked the Republicans questions for them! David Hamilton is eminently qualified to sit on the Seventh Circuit. We hope the Committee will move his nomination forward when the Senate returns from its upcoming two-week recess.